This week, my uncle passed away. People keep asking, "Was it sudden?". I never really know how to answer that question. He was 82. He moved to Ohio because he was told by doctors he could have another massive stroke at any time. It's not like he didn't know this could happen. We should have all been prepared. But was it sudden? If that question means was he lying in a hospital bed sick and suffering then, yes, it was sudden. He was actually in pretty good health. So yes, it was sudden. Or do people mean did he die quickly with no pain? Maybe that's the part of this story that is so awful because the answer would be no. His death is the part of his life's story that is the saddest. I won't share exactly what happened, but he suffered, alone, trying to get help and not being able to. The thing is, if we focus on that, people would never know what a full and adventurous life he led. My Uncle Bill was the most lively man you could have ever met. I don't usually use real names, but I want people to know him. There was not a single person who ever met him and didn't like him. Seriously. He was just that way. He embraced life. He thought it was worth living and he lived it to the fullest. He had adventures in his life most people, including myself, only dream of. He traveled to more places than I could possibly list. And he had stories from every last place. When he was right out of high school, Uncle Bill would get jobs here and there just to make enough money to go someplace. Once he saved a certain amount, he would pack up, and just go someplace. Once, he moved to Hawaii just to hang out on the beach. He did that until he ran out of money. Then he'd pack up and come back to the Cleveland area. He'd get another job and start the process all over. Even once he decided to "settle down" and take a job as a postal worker, he never stopped traveling. He would go on one or two trips a year to wherever he thought was an interesting place at the moment. He really enjoyed Switzerland. If I recall correctly, that's where he traveled to most. The last time he was in Switzerland was only about 5 years ago. My uncle had a story for everything, but he was also great at listening. I think was part of what made him truly special. He didn't just listen to your story, he listened to your stories. It's one thing to be able to talk and talk and another to be able to sit and actually listen. And he remembered. He could remember people he met by stories they told him. He also would retell those stories as a way of passing along parts of history. Uncle Bill was not one to live with the "what ifs". He also wasn't one to question the "why" in life. Things just were and he accepted them. Right now, if I stop to really think about his death, I have the "whys" and "what ifs". So I won't be thinking about his death. I'll be thinking about his full life. As I told my son, "We can be sad Uncle Bill is gone, but he lived such a full life. We need to be thankful that he was able to live such a great life for as long as he did." I'm hoping my dad will someday find comfort in this. I hope my dad will be able to find comfort in knowing how many lives Uncle Bill touched and how many people he helped along his journey. Death is sad for those left behind. We need to remember to keep celebrating the life he led. Even though this is the time of year where we are supposed to find more grace and understanding, it's actually the time of year where patience runs thin and tension runs high. It's the time of year that those in customer service receive the most grief. I've dealt with my fair share of grouchy customer service people. I have, though I don't like to admit, been grouchy to customer service people. The majority of the time though, customer service people are friendly. They do their jobs; nothing more, nothing less. But, every now and then, one comes across customer service that surprises you. Several weeks ago, my son had his book fair at school. He truly wants for nothing, so when I told him to pick out anything at all from the book fair, and he chose the $25 Gotcha Gadgets kit, I bought it. He was so excited. He and Daddy worked on it the moment Daddy go home. Then, oops, we had no 9V battery. Never fear, Grandma brought one over the next day! Everyone was super excited to see what this gadget did. Unfortunately, it did nothing. Not a thing. They took it apart and put it back together. Still nothing. After checking all the wires, Husband figured it had to be the board. It frustrated me that I spent pretty good money on this and it didn't work. Monster was so sweet and understanding and was just thankful he still had the book that went with it even if it didn't work. The Gotcha Gadgets is actually pretty cool. I highly recommend it for anyone with kids who are interested in science, engineering, inventing, building, etc. Monster (7) did need help with it, so I'd say it's for older kids if you don't want to help out, but even Sunshine (4) likes it and can learn from it with adult help! Gift giving holidays are coming up. I was looking at the Klutz website and they have so many cool things. So many more on their site than I have ever seen in stores. I highly recommend checking them out, even if a noisy gadget isn't for you. You are sure to find something that fits your needs in their huge selection of products! It has been a while since I've reviewed some of my favorite products. Maybe that's because it's been a while since I've been super impressed with something. Normally, I'm a Seventh Generation or Method dish soap girl. However, every now and again, propaganda works on me and I branch out and try something else. This is one of those cases. About 99% of the time, the product is never as good as what it says on TV. I know this, yet I keep seeming to fall for it (after all, Diet Dr. Pepper really does taste more like regular Dr. Pepper!) I saw this commercial, maybe over a year ago, but this stuff sticks in my brain, for Dawn Power Clean. It promises overnight soaking power in 5 minutes....see really it's ingrained in my brain and I can recite slogans from years ago. I don't know why, but I just had to try it. But, being the green cleaner I am, I kept putting it off. Finally, a coupon plus a sale got to me and I bought it. Wow! This stuff is awesome! I do have to say, the first couple of times I used it, the smell got to me because I normally get scent free products, but now I don't even notice the fragrance. The amazing cleaning power of this stuff makes up for the fact that it has fragrance in it (also, there may be a fragrance free one, but not where I bought it). This stuff cuts through grease like magic. It also really does have the power of overnight soaking in 5 minutes. My baked spaghetti dish was it's true test. I use a glass casserole dish for this meal. Normally, even after soaking overnight, I really have to scrub to get the burnt stuff off. Not with Dawn Power Clean. I added one little squirt and hot water. I probably actually let it sit for 30 minutes because I got involved in other stuff, but when I came back to it, one quick wipe with the sponge got everything off! I was seriously amazed. I also, being the cynic I am, thought it was a fluke. A few days later, I tested it on our old scrambled egg pan. Now, when I cook scrambled eggs, I can make it so barely anything sticks. When Husband cooks eggs in the particular pan, well, let's just say it needs soaking action so I'm not scrubbing for hours. Again, a little squirt and hot water. About 5 minutes later, the pan wiped clean! Anything that cuts down on my cleaning time and makes my life easier, I'm all for! Definitely worth buying! Even during all the craziness here, we've made time to do fun little crafts. 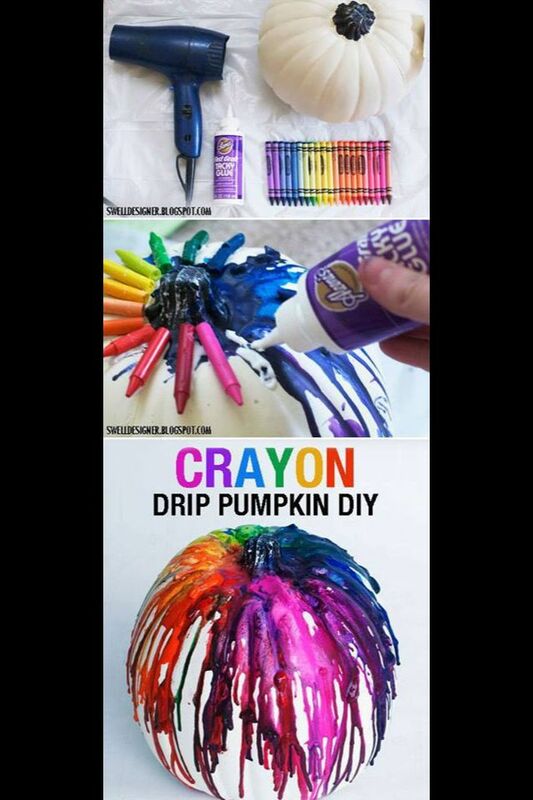 I saw the cool idea of melted crayons on a pumpkin on Pinterest. So, I got my pumpkin all ready and then, I stood there, for over an hour, with a hair dryer, and still, some crayons never melted. Luckily, with Husband's job, he has a heat gun. After getting that out, the pumpkin was AWESOME in under 10 minutes. I do not suggest doing this if you don't have a heat gun, unless you have hours to kill. Will definitely do this again next year, minus the time with the hair dryer! Another thing I found on Pinterest was this door sign. I didn't want mine to be as long, so I changed it up a little. The kids got to pick the kind of faces they wanted on their hands. Yes, I know this is the second time I'm posting this, but this time I added a link with it. This time of year would not be complete without pumpkin carving and painting. This year there were pumpkins everywhere! We had more pumpkins this year than we have ever had in the past, and it was great! Both kids got to tell Daddy exactly how their wanted their jack-o-lantern faces to look. They turned out super cute! Sunshine's is smiling, of course. Monster's looks mean. I got to do the surprised one. While Husband was working with the carving, the kids painted pumpkins. I painted our annual taped off "R" pumpkin because, by the time we got to that one, the kids were pretty much done. Sunshine also made us some very nice paper jack-o-lanterns at a MOMS Club event we attended. Every year since Husband and I have been carving pumpkins, we have tried roasting pumpkin seeds. Last year was the closest we came to success. Still, even then, Sunshine was really the only one who would eat them (which is odd since she eats nothing!) This year, I found yet another recipe for pumpkin seeds. After all our failure, what's one more recipe to try? This recipe has you soak the seeds in salt water. This one was a success!!! I did change up the recipe though because we have had issues with our seeds burning. By changing it up, my way took a LOT longer than the recipe says. Completely worth the time though! I soaked the seeds in salt water like the recipe said. After that, I let the seeds air dry, well, almost completely dry at least. Then, I baked them at 200 degrees for several hours. My first batch was faster than my second because I tested it out with only about 1/4 of the seeds. I'm glad I did test though. I didn't add the salt to the top like in the recipe. I did this because one complaint last year was that they were too salty. So, I left off the additional salt. I'm so glad I did because they were plenty salty from just being soaked in salt water! I will definitely be doing this one again next year! Immediately after Halloween was over, I started working on Thanksgiving. I feel bad for Thanksgiving because I need to rush since it's so close to Halloween and Christmas. I want to cram as much Thanksgiving stuff in as I can! First things my kids did was make Thanksgiving cards (and Veteran's Day and winter holiday, but most were Thanksgiving) for veterans and active soldiers. I forgot to take pictures of them, but my kids did a great job! And now, Monster knows how to spell country due to writing, "Thank you for serving our country" over and over. We also made "thankful" leaves. Here is where I have to thank my dear friends for thinking of me and bringing the leftover craft pieces from an event to my house (so thank you, A!). These leaves are super cool. They have a wax like covering that, when scraped off, have rainbow colors under it. Originally, I was just going to have the kids do designs, but then I changed it up and decided to combine another activity I had planned with them. I was going to make a "thankful" tree with handprints. To save time, I just used the leaves. The kids were great. The things they came up with were, well, interesting. I didn't want repeats, so they couldn't use what the other had done. They decided they were thankful for their family, friends, dog, country, world, and the sun (because without the sun, there would be no life...guess someone is paying attention in science). One of the nicest parts of this was that Sunshine got to practice writing and sounding out words. Instead of a tree, we are hanging them from the dining room chandelier, sort of like a Thanksgiving centerpiece. No autumn is complete without collecting beautiful leaves and no Thanksgiving is complete without turkeys. We combined the two this year. The house at the corner of the street where we pick Monster up from school has the most vibrant red leaves. Sunshine gathered a whole bouquet of them. We then made turkeys and used those wonderful leaves as feathers. Unfortunately, the picture really doesn't do the leaves justice. There were probably more things in there that we did, but when I'm this far behind on posting, I can't be expected to remember it all! I know I've written about this before, but I just can't stress enough how lucky I am that my children are truly best friends. They may fight like cats and dogs, but they love each other just as fiercely. Monster had a project that he was doing at school. The project was writing on a topic and then turning it into a book. Instead of choosing something he was interested in, he chose to write something just for his sister. He wrote a book all about fairy crafts. He even chose pink paper to make the cover since she loves pink. When he was able to bring the finished book home, he sat down and read it to Sunshine. She was, and still is, in heaven with this book. It really has very little to do with the content, it's the fact that her brother made something special at school that is just for her. Last night, Monster and I were out late for an activity. When we came home, we found that Sunshine was still awake, past bedtime. Know what she asked Husband? She asked him who would protect her if Monster wasn't home. She couldn't sleep knowing her brother wasn't here. She is always asking, "What do you think [Monster] is doing right now?" while he is at school. If we drive by the school, she is always looking for him. If I'm shopping with Monster, he is always looking for things his sister would like. Even more important than the two of them being best friends, they are teaching each other tolerance and acceptance. Sunshine definitely tests Monster's patience. She tests all of our patience. She teaches him self control. When he'd really like to haul off and slug her (and, honestly, most of the time, it would be justified), he models how to control his anger. "[Sunshine], you are making me so mad right now!" His self control is teaching her self control. They also teach each other how you can be yourself and do your own thing while being part of a team. How the two of them combine imaginations is incredible. They let each other be who they are. So often kids want to only play something their own way and it has to be just so and if it's not, they don't want others playing. Monster and Sunshine are so different yet they can combine their interests to make each other happy. Sunshine will be dressed like a princess while having a sword fight. Monster will be pretending to be Merlin while taking care of Sunshine's baby dolls. Of course there are times they don't want to play with each other, and that's fine, too. They talk it out. As Thanksgiving approaches, I think about how very thankful I am that my children love each other so much. I know their relationship will change as they get older, but they have a bond that can't be broken. They may have years that they don't want to spend time together, but I am confident that they will always be there for each other and lean on each other. I am so proud of the two of them and the relationship that they have built. I have a lot of posts started, but not finished. That means, hopefully, I'll be posting something almost every day for bit. I was going to try to combine it all in this post, but time has yet again gotten away from me and I will soon have to wake my darling angels up for school. I will just make this post short and sweet. The school levy passed last night! This has been a huge stress in my life. When I got the text last night that it passed, it felt as though a huge weight had been lifted. I am so happy that the community came together for this. The levy passing means many things, but the most important thing to my children is that they can now go to school together. Thank you to everyone who listened to me go on and on about the levy and the educational system in general. Thank you everyone who voted yes for our children, our future.